Optiv’s Cyber Threat Intelligence-as-a-Service determines if you have been exploited on the clear, deep and dark web to provide proactive reporting, actionable analysis and detailed remediation guidance. We help you to gain a decision advantage by enhancing your visibility into externally validated threats which directly affect your organization, clients, brand, executives or physical location. 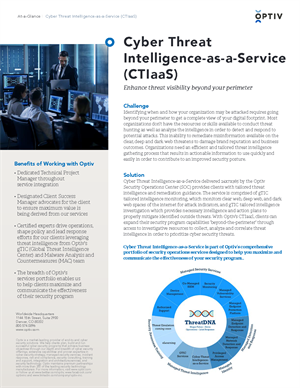 Optiv provides organization-specific threat intelligence that provides actionable information for strengthening your security posture.